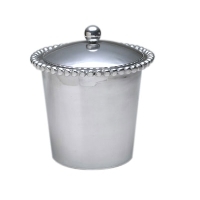 This pearled ice bucket complete with a decorative cover will keep your ice from melting long after your guests have gone home! Part of Mariposa's String of Pearls collection. Designed by Michael Updike. Handmade in Mexico of recycled sandcast aluminum. Dimensions: 7" H x 8" W.